In many wine regions in the world, grape harvest is a true spectacle. One of the most impressive ways of harvesting is the night harvest of Rueda (Valladolid). After a long and cold winter, and a very hot summer with high temperature variations between day and night, it arrives the time to pick up the result of the work of the whole year. At the beginning of September, at midnight, harvest starts in Rueda appellation. 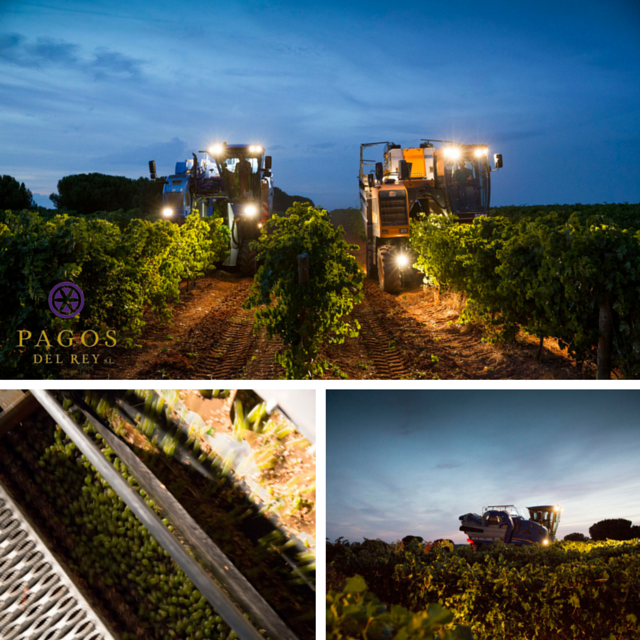 Several machines turn on their brilliant lights over the vineyards to pick up the grapes until the first sunlight. Vineyards are placed in a way that enables grapes to be picked but these impressive machines that use a vibration system that does not harm the plant. After harvesting, these machines transport the grapes to a truck and tractor that is waiting patiently in the vineyard and that will take the grapes to the winery. When grapes arrive in the winery, grapes are kept in low temperature so they do not start fermentation until the desired moment. Grapes are then pressed and must is taken to a tank to start the fermentation. Grape harvest at night is done to avoid sunlight and high temperature that may affect the wine and all the characteristic aromas are preserved. This system produced very fruity wines, representative of the area, with notes of herbs, fruit and an excellent acidity. Verdejo and sauvignon blanc are the most cultivated grapes in Rueda.